Chrontel’s CH7106B is a low-cost, low-power semiconductor device that consists of HDMI receiver, three separate 9-bit video Digital-to-Analog Converters (DACs), SDTV encoder, HDTV encoder and audio encoder, which can convert HDMI signals into CVBS/S-Video/YPbPr/VGA outputs with IIS or SPDIF audio output. The HDMI Receiver integrated is compliant with HDMI 1.4b. With sophisticated MCU and the on-chip flash, CH7106B supports auto-boot and EDID buffer. 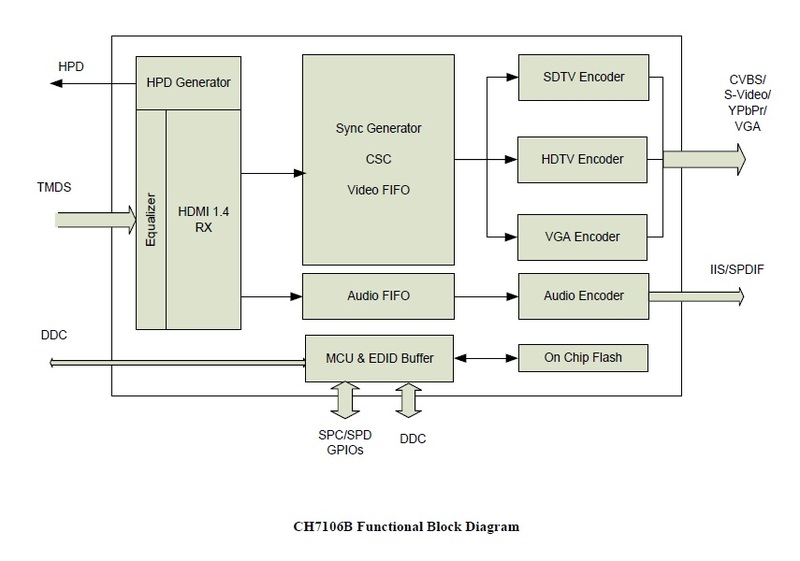 Leveraging the Firmware auto loaded from the embedded flash, CH7106B can support HDMI input detection, DAC connection detection and determine to enter into Power saving mode automatically.